Peter Cornelius Hoof was taken captive by pirates nearly three centuries ago. But Laura Nelson has an intriguing connection to him. Here, she follows on from her first post (link here) and continues to tell Hoof’s intriguing story of capture and life on the high seas. Of being in prison, Peter said there was never enough food or water. He was always thirsty and hungry. There were long hours of nothing to do but sit and think – think about how he would like to see his family again and how he had disappointed his father and broken his mother's heart. He thought of the sorrow he was causing them, how he should have returned to his family, and what he wouldn't give to hug his mother again and hear her voice. 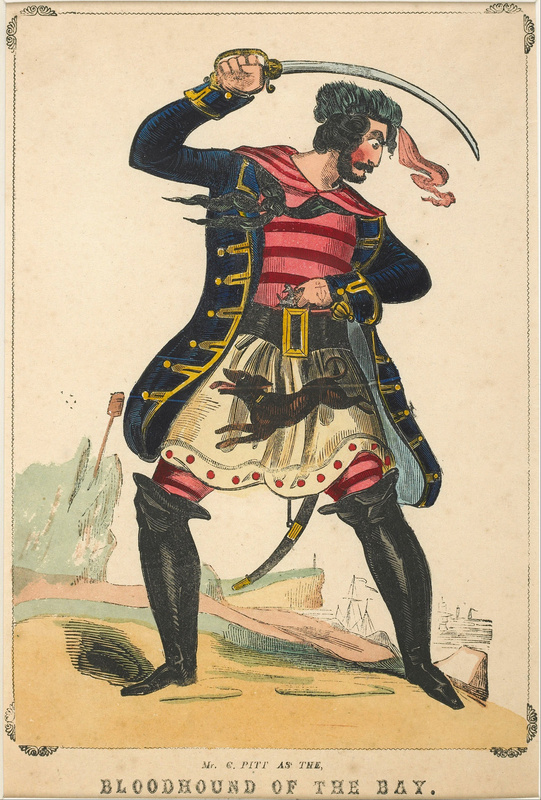 "Mr C. Pitt as the Bloodhound of the Bay", a portrait of a pirate in the Museum of London. On 5 September 1717, unknown to the incarcerated pirates, King George I issued a royal proclamation for the suppression of piracy that included a pardon. This is important to note, because there is some debate as to when exactly the authorities in Boston became aware of the pardon. There is some speculation that they knew the arrival of the pardon was imminent and thus hastened the trial and execution before it did. “The proclamation was sent out to the governors in the West Indies and the American colonies, who then had the responsibility of contacting the pirates.” (Cordingly, 205) On 9 December 1717, the Boston News-Letter published the proclamation. The Whydah pirates had been tried and convicted in October. While the pirates awaited their trial, the Reverend Cotton Mather ministered to them. The eight pirates from the Mary Anne were about the third group of pirates he had ministered to since the famous Salem witch trials of 1690. At one point during the course of these discussions, Mather noted in his diary, "Obtain a reprieve and, if it may be, a pardon for one [of the] Pyrates, who is not only more penitent, but also more innocent than the rest." (Woodard, 227) Unfortunately, inquiries into historical records in Boston failed to unearth any evidence that Mather ever took any official steps towards obtaining such a pardon, nor for which specific pirate he meant to do so. Peter says that during one of his sessions, the Reverend Mather wrote a letter to Peter's parents for him. He told them how sorry he was for hurting them so much. He also apologized for being a bad son and for not being more dutiful to them. Tried alongside Peter were Simon Van Vorst, John Brown, Hendrick Quintor, John Shuan, Thomas South, and Thomas Baker. It was time for them to face the court, and what a court they faced! Lieutenant Governour. The Honourable Elisha Hutchinson, Penn Townsend, Andrew Belcher, John Cushing, Nathaniel Norden, John Wheelwright, Benjamin Lynde, Thomas Hutchinson, and Thomas Fitch, Esqrs; of His Majesty's Council for this Province. John Meinzies Esq; Judge of the Vice Admiralty. At this point in the trial, Simon Van Vorst asked for counsel for the pirates "that so they might be well advised on what to do." (Trial, 297) His request was granted, and one attorney, Robert Auchmuty, was appointed to defend all seven of the pirates, but after two of his motions were denied, he resigned. (Trial, 299) One of those motions was to allow Thomas Davis, a carpenter on the Whydah, to be brought in to give evidence on the pirates' behalf. The motion was rejected because Davis was also in prison for the same offense and his guilt or innocence had not yet been determined. (7) So the illiterate pirates were left to face the court alone. They all pleaded not guilty to the charges. They were given copies of the indictment and about two days to prepare for their trial. Weakened after months of confinement in a dark cell and a bread-and-water diet and compelled to stand during these proceedings, you can imagine how hard it was for any of the pirates to understand what the Advocate General was saying, much less what all of it meant. Mostly they understood that the entire proceedings were set heavily against them and they were in serious trouble. An interesting part of reading the trial transcript is that the prosecutor and witnesses have statements of one or more paragraphs, while the pirates' statements are sometimes only a sentence or two long. Obviously not much care was taken to record what each one actually said in his defense, an obvious bias by today's standards. During their imprisonment, Blackbeard vowed to come to Boston to rescue them and actually did set out towards Boston from the West Indies. But before he had gone far, or had even left the harbor (depending on what source you read), he found out the authorities in Boston had blockaded the harbor with a man-of-war and several other ships. This represented way too much firepower for a pirate ship, so Blackbeard abandoned the rescue attempt. After the six pirates were hanged, he took out his vengeance on several ships from Boston, burning them to the waterline, cargo and all. One specific example was a ship called the Protestant Caesar, in the Bay of Honduras. Although Peter’s trial was completed on 18 October, he and the other pirates were not hanged until 15 November 1717. All of them, except Thomas Davis, were found guilty of the crimes of piracy, robbery and felony on the High Seas. They were sentenced to be hanged until dead. Thomas Davis, a carpenter, was the only one whose plea of being a forced man was believed by the court. He was found not guilty. In 1717 hanging was not like you see in Wild West movies where the noose is tied around the neck, a horse or wagon is kicked out from underneath the victim, his neck snaps from the force of the drop and, in a couple of minutes, he is dead. Hanging at this time was done by a method called the short drop. The noose was around the neck, but the body was only dropped a short distance, not enough to break the neck. What killed the person was the slow movement of the noose against the neck, causing a prolonged, torturous death by slow asphyxiation. The entire process took about fifteen to twenty minutes, during which time the body naturally struggled to breathe. Hangings were a public event, attended by hordes of people, who jeered and taunted the victims. Even children were brought along to watch the victims choke to death. To get to the scaffold, the pirates walked through town to a canoe, where they were then rowed across to the mudflats at the Charlestown ferry landing to be hanged. Cotton Mather accompanied them to the place of execution. Unfortunately, he did not record all of the conversations he had with the eight men during their several months of confinement. Aside from their interrogations before the trial, Mather only published his final conversations with them as they walked to the gallows. To add yet another unfortunate aspect to the lack of historical documents, he only wrote down these conversations after the hangings were concluded. He apparently was not accompanied by any sort of secretary or scribe to record the conversations as they happened. So their content must be seen through the filter of Mather's recollection. CM: Hoof; A melted Heart would now be a comfortable Symptom upon thee. Do you find anything of it? PH: Something of it; I wish it were more! CM: To pursue the Good Intention, I will now give a Blow with an hammer, that breaks the Rocks to pieces. I will bring you the most Heart-melting Word, as ever was heard in the World. We find in the Sacred Scripture such a word as this; CHRIST, who is GOD, does beseech you, Be ye Reconciled unto GOD. That ever the Son of GOD should come to us, with such a Message from His Eternal Father! What? After we have so Offended His Infinite Majesty! After we have been so Vile, so Vile – and He stands in so little Need of us! To beseech such Criminals, to be Reconciled unto the Holy GOD, and be willing to be Happy in His Favour! O Wonderful! Wonderful! Methinks, it cannot be heard without flowing Tears of Joy! PH: Ah! But what shall I do to be Reconciled unto GOD! CM: Make an Answer, make an Echo, unto this Wonderful World of your SAVIOUR. And what can you make but this? – And for this also, you must have the Help of His Grace to make it; O my dear SAVIOUR, I beseech thee to Reconcile me unto GOD. PH: Oh! That it might be so! CM: A Reconciliation to GOD is the only thing that you have now to be concern’d about. If this be not accomplished before a few minutes more are Expired, you go into the Strange Punishment reserved for the Workers of Iniquity. You go, where He that made you, will not have Mercy on you; He that formed you, will shew you no favour. But it is not yet altogether Too Late. An Hearty Consent unto the Motions of the Reconciler, will prepare you to pass from an Ignominious Death, into [an] Inconceivable Glory. PH: Oh! Let me hear them! CM: First, You must Consent unto This; O my SAVIOUR, I fly to thy Sacrifice, I beg, I beg, that for the sake of That, thy Wrath may be turned away from me; I cannot bear to have thy Wrath Lying on me! Can you say so! PH: I say it, I say it! CM: But then, you must Consent unto This also; O my SAVIOUR, I Cry unto thee, to take away all that is contrary to GOD in my Soul; and cause me to Love God with all my Soul; and Conquer my depraved Will; and bring to Right all that is Wrong in my Affections; and let my Will become entirely subject unto the Will of GOD in all things. Can you say so. PH: I say it, I say it! CM: lf it be heartily said, The Reconciliation is accomplished. But if you were to Live your Life over again, how would you Live it? PH: Not as I have done! PH: In serving of GOD, and in doing of Good unto Men. CM: God Accept you. Oh! That your SAVIOUR, might now say to you as He said in a Dying Hour, unto One, who died as a Thief, This Day thou shalt be with me in Paradise. I do with some Encouragement leave you in His Glorious Hands. PH: O my dear JESUS! I lay hold on thee; and I resolve, never, never, to let thee go! CM: May he help you to keep you hold, of the Hope set before you. PH: My death this Afternoon is nothing 'tis nothing; 'Tis the wrath of a terrible GOD after Death abiding on me, which is all that I am afraid of. No death certificate exists for Peter. Lacking burial records, modern researchers believe that after the pirates were hanged, their bodies were subsequently covered in tar and hung in gibbets near the harbor to rot and serve as a warning to sailors against becoming pirates. Absent other evidence, it would seem that this was the fate of the Whydah pirates. Unfortunately, because of centuries of “wharfing-out,” the filling in and building up of land to extend the city farther into the harbor, it is no longer possible to walk the same ground that Peter did in 1717, as that ground simply no longer exists. The jail where he was held is long gone. The Old State House, where the trial was held, used to be almost at the harbor, but is now in the middle of downtown Boston (again because of the wharfing-out process). The building itself only vaguely resembles its original design. It has been re-purposed, restored, and re-built several times over the ensuing centuries. For example, the last time it was "re-worked," the architect installed a spiral staircase, which is not authentic to the building as the original design did not have one. Early in the 1900s the basement of the Old State House was excavated and turned into a subway stop now appropriately called the State station. It took public outcry to bring in legislation to prevent further commercialization of the building. While visiting Boston, I made a trip to Provincetown, on Cape Cod, to visit the Whydah Pirate Museum. There I was able to see even more artifacts of the wreck of the Whydah. I was able to touch more coins, some ballast stones, a cannon round, and a bar shot. And yes, I got the same energy drain that I experienced during the traveling Real Pirates exhibit. In fact, I almost fell over! Through all of this, Peter has been a wonderful person to work with. He was a happy-go-lucky person before the pirates took him captive. He still has a wonderful sense of humor. He also has the manners of a gentleman, even though the class restrictions of his day prevented him from actually being one. This ability to walk in both worlds, the world of manners and the world of the pirates, allowed him to survive and function among the pirates. I hope that writing this article will help his soul to move forward as he hoped. The lesson I wish for you to take away from this is that any one of us, even someone who considers himself or herself to be a nice person, as Peter did, can make a poor choice or a bad decision. In Peter’s case, his choices and decisions put him into a situation that he could not readily get out of. It can happen to anyone. This article is provided by the Pirates and Privateers blog here. If you have questions about Peter, you can contact Laura at PeterandLaura55@yahoo.com, or you can visit her blog via: PeterCorneliusHoof.blogspot.com. Copyright 2013 by Laura Nelson. 1. Real Pirates tells the story of the Whydah and how she went from being a slave ship to a pirate ship. It’s a traveling exhibition sponsored by National Geographic with artifacts from the Whydah Pirate Museum in Provincetown, Massachusetts and established by Barry Clifford, the underwater explorer who discovered the wreck of the Whydah off Cape Cod. 2. Peter Hoof is not the lover that is mentioned here. That person’s name is Andre. 3. A periaga, more commonly spelled piragua or pirogue, was a canoe favored by Caribbean pirates during the seventeenth and eighteenth centuries. Both Alexandre Exquemelin and William Dampier described them in their books. Benerson Little provides more details on these favored boats in A Sea Rover’s Practice on pages 49-52. 4. Appointed chief physician to the Haslar Naval Hospital in 1797, Thomas Trotter observed young patients who were despondent. “He attributed this to the horror of the patients whose next bed neighbor might be a seaman hospitalized because of brutal lacerations and festering sores at the draining sites of whiplash wounds on his back and buttocks.” (Friedenberg, 31) The United States Navy abolished flogging in 1840. 5. Nowadays we call this phenomenon the Stockholm Syndrome, where hostages or captives identify with their captors and perhaps even to defend them. The name derives from a 1973 hostage incident in Stockholm, Sweden. At the end of six days of captivity in a bank, several kidnap victims actually resisted rescue attempts and afterwards refused to testify against their captors. The behavior is considered a common survival strategy for victims of interpersonal abuse. Two of the most famous examples are Patty Hearst and, more recently, Elizabeth Smart. See "Understanding Stockholm Syndrome" by Nathalie de Fabrique, Stephen J. Romano, Gregory M. Vecchi, and Vincent B. Van Hasselt in the July 2007 FBI Law Enforcement Bulletin, US Dept. of Justice, FBI, 76:7, 10-15. 6. Eastham is on Cape Cod. 7. Davis was tried separately and found not guilty. Burgess, Robert F. Finding Sunken Treasure: True Story of the Pirate Ship Whydah. Spyglass Publications, 2012. Clifford, Barry. Expedition Whydah: The Story of the World's First Excavation of a Pirate Treasure Ship and the Man Who Found Her. Cliff Street Books, 1999. Clifford, Barry, and Kenneth J. Kinkor. Real Pirates: The Untold Story of the Whydah from Slave Ship to Pirate Ship. National Geographic, 2007. Cordingly, David. Under the Black Flag: The Romance and the Reality of Life Among the Pirates. Random House, 2006. Dana, Richard Henry. Two Years Before the Mast. Penguin Books, 1840. Dethlefsen, Edwin. Whidah: Cape Cod's Mystery Treasure Ship. Seafarer's Heritage Library, 1984. Friedenberg, Zachary B. Medicine under Sail. Naval Institute Press, 2002. Lee, Robert E. Blackbeard the Pirate: A Reappraisal of His Life and Times. John F. Blair, 1974. Mather, Cotton. "Instructions to the Living, from the Condition of the Dead" in British Piracy in the Golden Age edited by Joel H. Baer. Pickering & Chatto, 2007, 4: 129-144. Mather, Cotton. “Warnings to Them that Make Haste to be Rich, in British Piracy in the Golden Age edited by Joel H. Baer. Pickering & Chatto, 2007, 4: 145-153. The Pirate’s Pocket-Book edited by Stuart Robertson. Conway, 2008. Rediker, Marcus. Villains of All Nations: Atlantic Pirates in the Golden Age. Beacon Press, 2005. Reynard, Elizabeth. "The ‘Pyrats’ and the Posse," in The Narrow Land: Folk Chronicles of Old Cape Cod. Chatham Historical Society, 1993. "The Trials of Eight Persons lndited for Piracy" in British Piracy in the Golden Age edited by Joel H. Baer. Pickering & Chatto, 2007, 2: 289-319. Vallar, Cindy. "Cotton Mather, Preacher to the Pirates" at Pirates & Privateers [http://www.cindyvallar.com/mather.html], 2009. Vanderbilt, Arthur T. Treasure Wreck: The Fortunes and Fate of the Pirate Ship Whydah. Schiffler Publishing, 2007. Special thanks to Bonnie Cormier of the Eastham Historical Society and Jessy Wheeler of the Boston Public Library for research help. Also to Cefton Springer for the stories of the use of the cat-o'-nine-tails in Barbados (his home country). Peter Cornelius Hoof was taken captive by pirates nearly three centuries ago. But Laura Nelson has an intriguing connection to him. Here, she tells Hoof’s intriguing story of capture and life on the high seas. My interest in Peter Cornelius Hoof began when I attended the Real Pirates Exhibit in Denver, Colorado, in June 2011. (1) Like many people, found the exhibit fascinating and came away with two books about piracy and what I thought, at the time, was a new interest in pirates. While reading these books, I became conscious of Peter Hoof and began to have a particular interest in him. Why his name leapt out at me from the pages of these books, I do not know. I may never know. All I know is that it happened, and my life has been enriched ever since. At one point in the exhibit, there was a display where visitors could actually touch coins from the wreck of the Whydah. While touching them, I felt a whooshing sensation and a drain of energy. I put it down to having been in the exhibit for a long time with no food or water. I just figured I must be really hungry and, once I got something to eat, I would feel better. During the next month, I did a lot of research on pirates. They were definitely a new obsession. Not only was I doing a lot of research, I wrote about them, too! I had done some writing while in college, but following graduation I never seemed to write for more than a paragraph or two. After attending the exhibit, my dreams involved sequences of events surrounding pirates. When I wrote down the most recent sequence, the events in the dreams moved forward. Neither the writing nor the dreams was sequential. There was, however, one common theme: a pirate with brown hair and eyes, who either sought me out or appeared out of nowhere to protect me from a dangerous situation. A month after my first visit, I returned to the exhibit. The second visit was in some ways more amazing than the first. When I approached the coin display, I discovered that, conveniently, no one else was around. I closed my eyes, took a deep breath, and asked if I had a connection to the wreck. I touched all of the coins, one or two at a time. Toward the end, a voice told me I was not on the Whydah, but that I lost a lover in the wreck. (2) Then I experienced the same whooshing sensation and drain of energy I had felt the first time I touched the coins. About a month after my second visit to the exhibit, I chanced to run across a medium, who did past life regression, at a county fair in Denver. I told her what had been happening to me, and she confirmed I was not a pirate myself, but that I did know many of them. Several members of my immediate family left with the pirates, which angered me because I was a female in that past life and thus could not go with them. During a second session with the medium in December 2011, Peter asked me to tell his story. His soul was stuck and telling his story would help him to move forward and go on. So I told his story to several people, but had a feeling while doing so that this was not the way to go. One friend said that even if it wasn't a best seller, I had to get his story out there. On that day, the idea for this article was born. Peter was not a captain among the pirates, but he was hanged for piracy, and for that reason his name is recorded in the record books. At the time Peter was taken captive, Sam Bellamy still sailed with a pirate named Benjamin Hornigold, who sailed in consort with the French pirate, Louie Labous (also known as Olivier Levasseur or La Buse). La Buse got the nickname of "The Buzzard" for the swift and merciless way he had of attacking his victims. Peter was considered to be “[a]mong the most prized of the new recruits.” (Clifford, 137) His previous seventeen years of sailing along the Spanish Main provided him with extensive knowledge of the southern Caribbean, and greatly added to the pirate’s navigational knowledge. A lot of you are fairly familiar with how pirates in the Golden Age took captives. They came upon a boat swiftly and used methods calculated to instill the maximum amount of fear in their targets. Imagine the scene: A large number of armed, screaming pirates come pouring over the side of your vessel after firing a shot across the bow of the ship. The captain of your ship has only put up a paltry defense and stopped his ship based on the theory that giving in to the pirates will prevent them from doing any more damage than is necessary to passengers and crew. You are forced into a corner and made to kneel to reduce the chance of you retaliating. Sailors in these days were poorly paid, some as little as a few shillings a month, so you have next to no personal possessions to speak of. Now the little that you own is in jeopardy of being taken away by the pirates. Then the captain of your vessel is forced to relate the skills and marital status of each member of the crew. Some volunteer to join the pirates, wanting a life of lawlessness and plundering. But not all go willingly. You are forced to accompany the pirates because of your knowledge and experience. You do not wish to join them, but your feelings in the matter are not considered. On the pirate vessel you are considered a prisoner. All of the status you spent your life working for is now gone. These people are not your friends. You have left behind the life you knew and the friends you made. That night, you are lifted to your feet, blindfolded, and marched to you know not where. When the blindfold is torn off, you face a sort of tribunal of the most senior of the pirates. Keep in mind that on the old sailing vessels the areas below decks were poorly lit, so you cannot see well. You face this tribunal alone. They sit behind a table. The rest of the pirates are amassed behind you, so there is no escape. If you refuse to sign the articles, you will be shot and your body will be summarily disposed of in the sea. So you sign, because you wish to live and have no alternative. After you sign, you realize that your life as you have known it is over and you feel as though you have made a deal with the devil. During interrogation before their trial in Boston, Massachusetts, one of the Whydah pirates, John Brown, testified that Peter “was once whip’d for attempting to Run-away . . .”. (Trial, 318) In his examination, Simon Van Vorst relates that while on the island of St. Croix, “ (3) of their Men Ran away, and one of them being brought back was severely whipped.” (Trial, 319) But he did not give specific names. The impression I got from Peter was that he felt this was his last chance to escape the pirates and return to his normal life. I also got the impression that at the "advanced" age of thirty-four, he wanted to return to a relationship with someone he had met in the past. Flogging (whipping) in Peter's time was done with a cat-o'-nine-tails, a device with a handle and nine ropes, usually with a piece of lead at the end of each one to tear the skin. All descriptions I have seen of this punishment describe it as being excruciatingly painful. During my next session with the medium, Peter described some of the ordeal: " After they were through whipping me, I could not move on my own. I slumped to the deck, helpless, tears streaming from my eyes, my throat raw from screaming, my body shaking uncontrollably with the pain. Eventually, someone took pity on me and picked me up, taking me to a dark quiet place where I was lucky that there was a doctor on board who cared enough to clean and stitch me up. My hands continued trembling for a long time; the pain is tremendous. I laid there nearly unmoving for three days. I had to be helped to the head and brought food. It was agony to eat. Eventually I was able to move on my own again, slowly at first, to keep the wounds from opening. I was lucky and my wounds did not become infected." Peter told me that he eventually became a pirate, but he did not torture or beat any prisoners or captives and did not approve of the pirates' treatment of women. The lesson he wished for me to take away from his experience was that you can do something bad, but not necessarily participate in every aspect of the bad thing. Some pirate historians doubt that men were pressed into serving on pirate ships. Some insist they only pretended to be forced to hide the fact that they actually wanted to go with the pirates and share in the booty and freedom of the pirate lifestyle. Claiming to have been pressed was a common plea by those accused of piracy at their trials. During his interrogation, Peter stated that "[n]o married men were forced" (Trial, 319), which to me means that some men must have been pressed, otherwise why be concerned about whether or not a man was married? Unfortunately, the transcript gives only his responses, and not what the actual questions were. Also, the interrogations were written down after the fact. When Peter was taken captive, Sam Bellamy was sailing as a member of Benjamin Hornigold's crew. Bellamy had joined Hornigold to learn the ropes of piracy. At the time of Peter's capture, Sam had taken it upon himself to attack Peter's ship while Hornigold was away getting supplies. Three weeks after Peter was taken, a difference arose amongst Hornigold's crew about whether or not to attack English ships. Hornigold did not wish to attack them, but Sam and others felt they were missing out on too many potentially lucrative targets. Following pirate tradition, the entire crew voted. Sam was elected captain and sailed away with half of the crew and some captives. Hornigold went his own way with the dissenting pirates, including a man named Edward Teach, who would later become known as Blackbeard. Bellamy and his crew of pirates traveled through Baya Honda, Cape Corrientes, and the Isle of Pines, then around to the eastern tip of Cuba. From June to August 1716, they were on the north coast of what is now Haiti. In September, they were in the area of present-day Puerto Rico. In October, they sailed from Samana Bay to Cape Nicholas, Hispaniola. Around November or December 1716, Bellamy captured a galley called Sultana in the vicinity of St. Croix. With a few "piratical" alterations, he made her his new flagship. In January 1717, La Buse and his crew decided to leave Bellamy's company and head in another direction. Their parting was friendly. Early in March, Bellamy was made aware of, either by unknown sources or by spotting, the Whydah, which was setting out on her return voyage to England after making the trip from Africa and the Caribbean (the "Middle Passage") to buy and sell slaves. Bellamy, who was seeking a "Ship of Force" so he could take larger prizes, pursued her. (Trial, 319) Peter's extensive knowledge of the South Caribbean was instrumental to the success of this pursuit, which lasted three days. Once they caught up to the Whydah, Bellamy only had to fire one or two shots across her bow to make Captain Lawrence Prince surrender. After taking over the ship, Bellamy allowed Captain Prince and some of his men who did not wish to become pirates to sail away in the Sultana with a few provisions and some silver and gold. After taking a few days to re-fit the Whydah to suit the purposes of pirating, Bellamy continued sailing, turning towards the east coast of America. Around 9:00 a.m. on 26 April 1717, Bellamy and his crew captured a ship called the Mary Anne. Seven names, including Peter's, were read off the watch bill and these were the men sent to board the prize. Five were armed with pistols and cutlasses. They took charge of the ship while sending five of her crew and captain to the Whydah to show Captain Bellamy their papers and be held as prisoners. The remaining crew members were kept on board Mary Anne to help sail the ship. The pirates soon learned that her hold was loaded with casks of Madeira, however the hatch was covered with heavy cables, making it too difficult for them to get into right then. The pirates had to content themselves with some wine they found in the cabins. A second small boat came over from the Whydah to get some wine to take back there. They also took some of the crew's clothes. Around 3PM, fog started to settle around the flotilla. This, in addition to being drunk, caused the pirates to have trouble following Bellamy's order to follow the Whydah and keep the vessels together. During the course of the evening, as the weather deteriorated, seven of the eight pirates aboard the Mary Anne worked on moving the cables off of the hatch to get at the Madeira in the hold. Once inside, they broke open the first barrels while taking turns at the helm. The pirates then ordered their captives to help handle the sails and man the pumps, because the hull of the Mary Anne was leaking. By the time darkness fell, the helm was completely turned over to one captive, Thomas Fitzgerald. The storm was in full force by 10:00 p.m. Twenty to thirty-foot seas battered the Mary Anne. Eventually they lost sight of the Whydah, and found themselves among the breakers where the ship ran aground. On the morning of 27 April 1717, the men found that one side of the ship was on dry land and they could walk on to what proved to be an island without having to get their feet wet. They broke open a chest and ate sweetmeats (sugared fruits) and other food they found and drank more wine. A local named John Cole spotted them and, mistaking them for shipwrecked mariners, came across in a canoe to bring them ashore just outside Eastham, Massachusetts. (6) According to local folklore, while at Cole’s house, Peter gazed out the south window of the great room and saw men approaching the house. This posse was led by Cole's son, who had snuck out of the house to inform the authorities about the pirates. Justice of the Peace Joseph Doane finally went with him to check out the situation. The pirates fled, but stopped at a tavern in Eastham. Legend says that Mr. Doane and the posse caught up to them at the tavern. He used liquor to loosen the pirates’ tongues. Later both the posse and the pirates went to sleep in the taproom. During the night, the pirates woke up and snuck out of the tavern. Continuing to stick together, they struck out for Rhode Island, which was known to shelter pirates. Before noon, the posse overtook them. They were taken to Boston under a heavy, mounted guard. There they remained in Boston's hot, foul prison until Friday, 18 October 1717, when they were led into the Admiralty Court. (Reynard) They wore the same clothes they had worn the night of the shipwreck. We shall continue the intriguing story of Peter Hoof in a blog post that will be published very soon.